Chief rabbi of the United Hebrew Congregations of the British empire; born in the city of Hanover, May, 1839; second son of Nathan Marcus Adler; educated at University College School and University College, London. He studied at Prague and Leipsic between 1860 and 1862, devoting especial attention to theology and the Talmud. In December, 1862, he received the degree of Ph.D. at Leipsic, and next year Chief Rabbi Rapoport of Prague conferred upon him the hattarat horaah (rabbinical diploma). 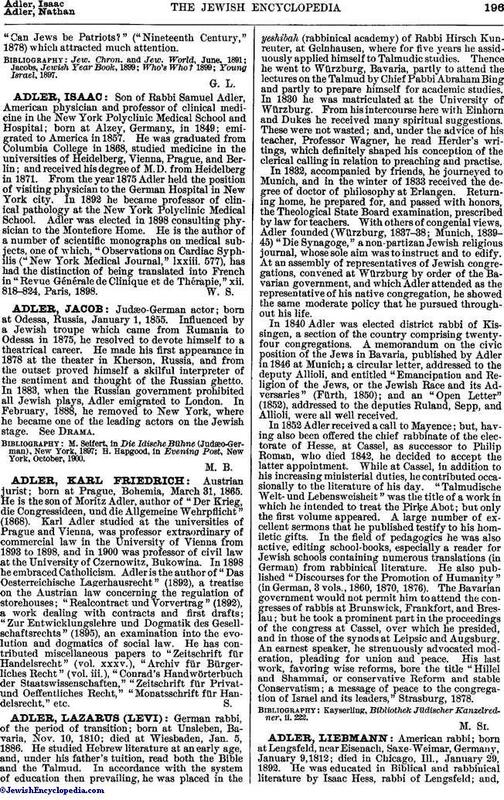 In 1863 Dr. Adler became principal of Jews' College, an institution for which, like his father, he always entertained a special regard. Though he was appointed minister of the Bayswater Synagogue, London, in 1864, he remained the tutor of theology in Jews' College until 1879, when he relinquished his active duties there. 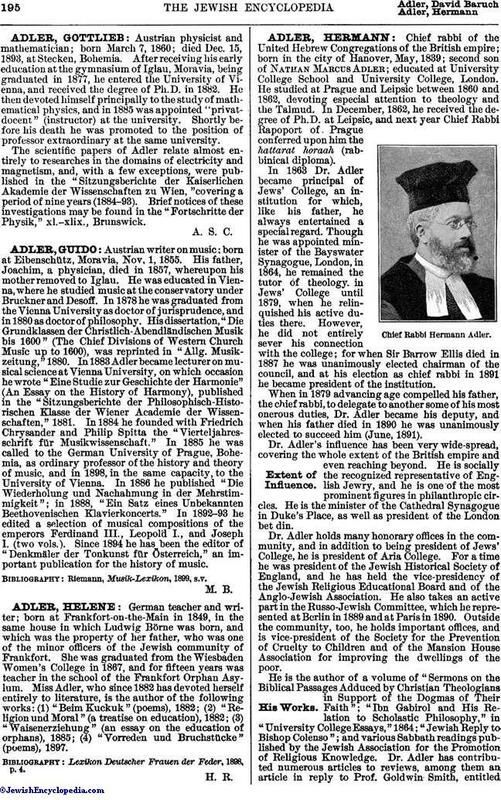 However, he did not entirely sever his connection with the college; for when Sir Barrow Ellis died in 1887 he was unanimously elected chairman of the council, and at his election as chief rabbi in 1891 he became president of the institution. When in 1879 advancing age compelled his father, the chief rabbi, to delegate to another some of his most onerous duties, Dr. Adler became his deputy, and when his father died in 1890 he was unanimously elected to succeed him (June, 1891). Dr. Adler's influence has been very wide-spread, covering the whole extent of the British empire and even reaching beyond. He is socially the recognized representative of English Jewry, and he is one of the most prominent figures in philanthropic circles. He is the minister of the Cathedral Synagogue in Duke's Place, as well as president of the London bet din. Dr. Adler holds many honorary offices in the community, and in addition to being president of Jews' College, he is president of Aria College. For a time he was president of the Jewish Historical Society of England, and he has held the vice-presidency of the Jewish Religious Educational Board and of the Anglo-Jewish Association. He also takes an active part in the Russo-Jewish Committee, which he represented at Berlin in 1889 and at Paris in 1890. Outside the community, too, he holds important offices, and is vice-president of the Society for the Prevention of Cruelty to Children and of the Mansion House Association for improving the dwellings of the poor. He is the author of a volume of "Sermons on the Biblical Passages Adduced by Christian Theologians in Support of the Dogmas of Their Faith"; "Ibn Gabirol and His Relation to Scholastic Philosophy," in "University College Essays," 1864; "Jewish Reply to Bishop Colenso"; and various Sabbath readings published by the Jewish Association for the Promotion of Religious Knowledge. Dr. Adler has contributed numerous articles to reviews, among them an article in reply to Prof. Goldwin Smith, entitled"Can Jews be Patriots?" ("Nineteenth Century," 1878) which attracted much attention.